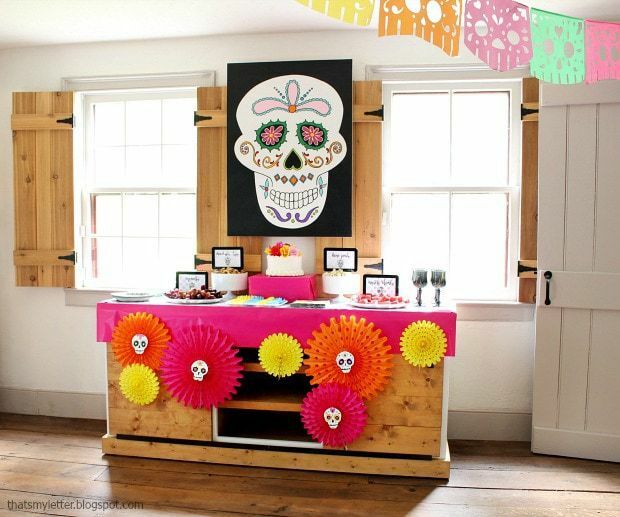 We’re celebrating two Fall birthdays with a sugar skull or Day of the Dead Halloween party and I thought I would share all the fun details. 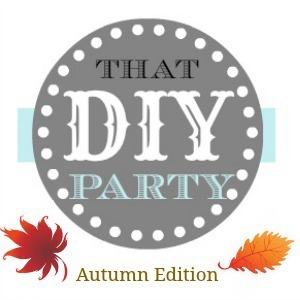 This is not your typical dark and scary Halloween party but completely the opposite. 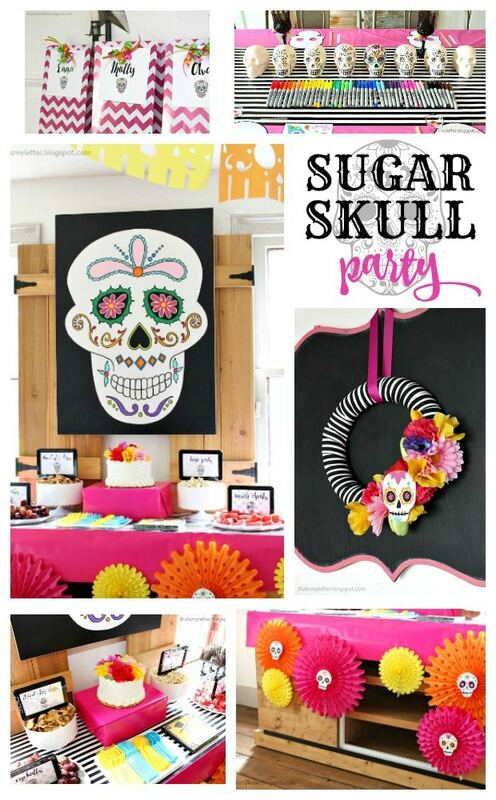 If you’re looking for a bright and colorful Halloween party theme then I highly suggest sugar skulls. 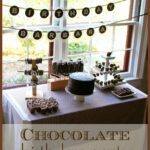 I had so much fun pulling together all the party decor with a few purchased items and a few DIY handmade items which helps keep costs down and you can customize to your liking. 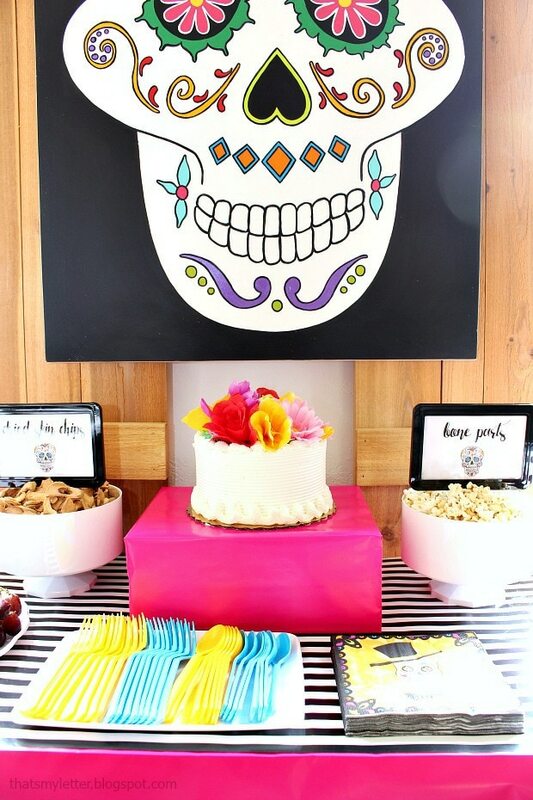 For the treat table I painted the giant sugar skull backdrop on a piece of 1/2″ plywood. 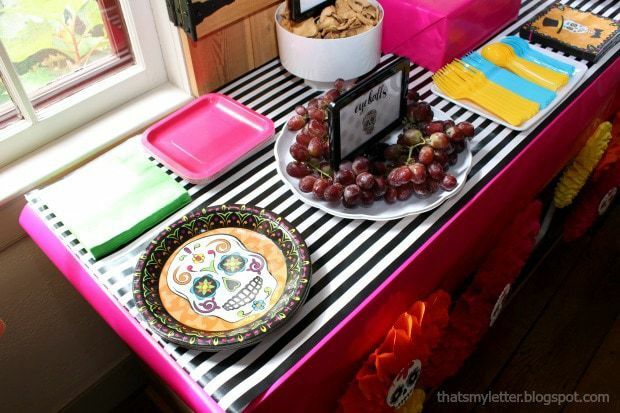 It’s perfect for behind the table and makes a huge impact. Adding the tissue fans breaks up the harsh edge of the wrapping paper cover and adds interest. 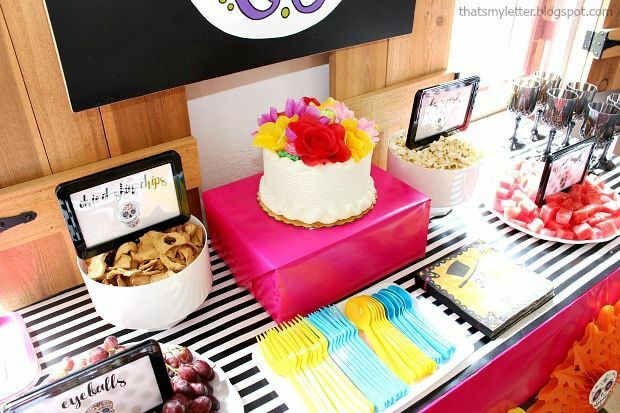 We had a few snacks and cake on the treat table (lunch was served separately later). 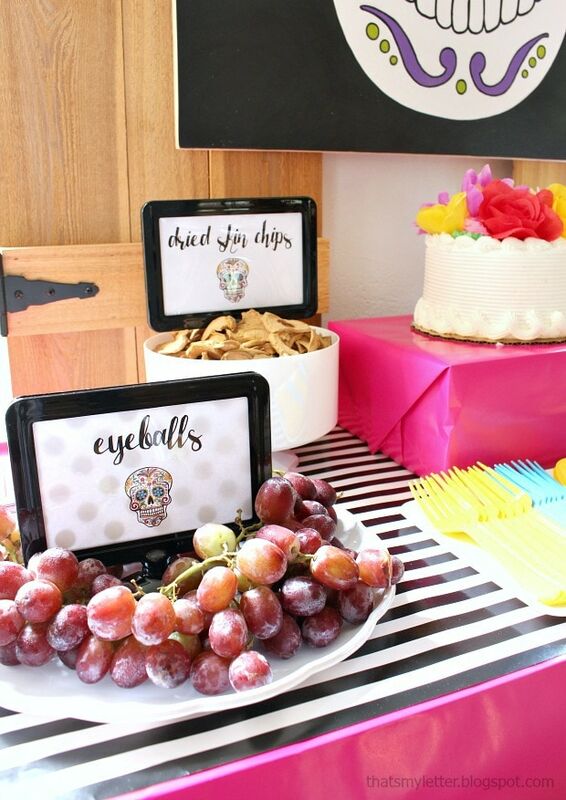 Dried skin chips (apple chips), eyeballs (grapes), muscle chunks (watermelon) and bone parts (popcorn). 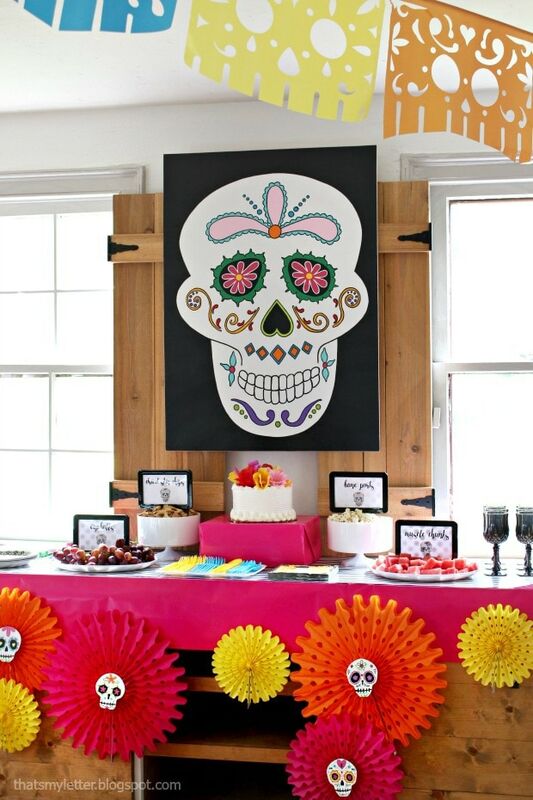 I also ordered a white frosted 7″ round cake with no decorations and added the silk flowers myself to coordinate with the sugar skull theme. 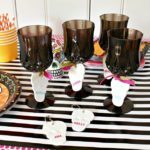 The kids loved the black plastic wine goblets and we filled them with blood! 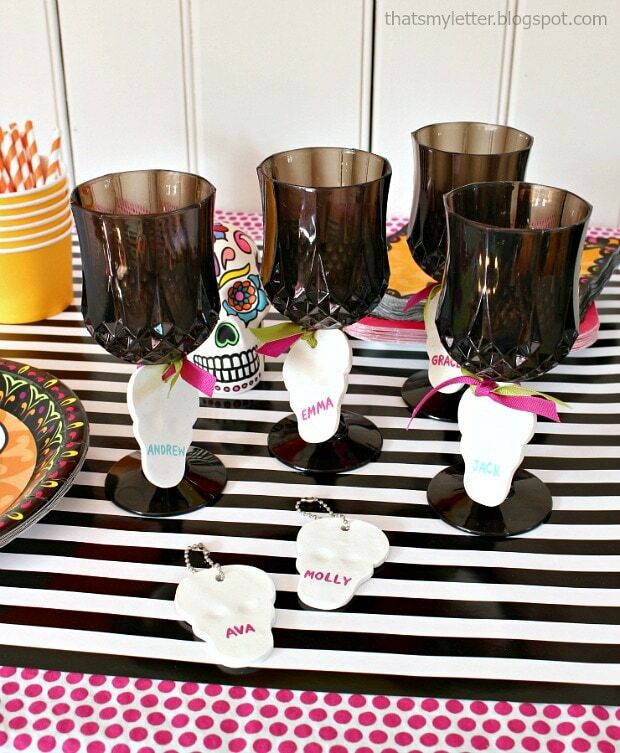 (fruit punch) Each glass had a clay skull name tag which I later removed and made into fobs for their backpacks. 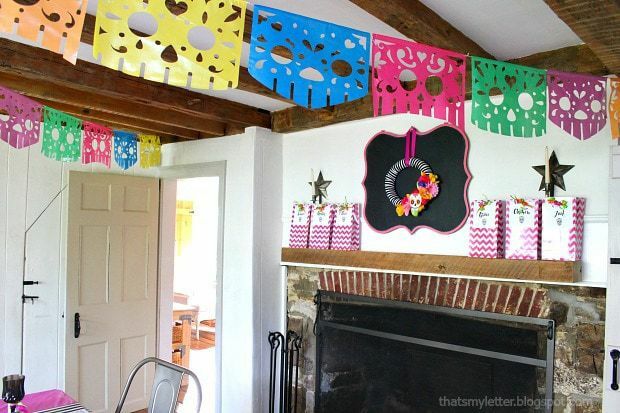 In the dining room I hung more plastic Day of the Dead cut out banner. 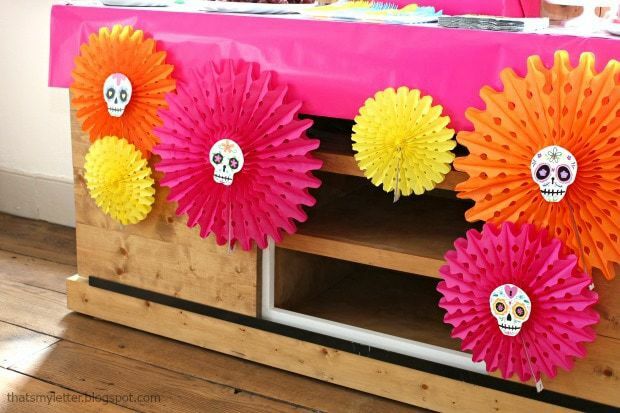 This was an awesome piece of decoration at 100′ long, it adds so much color and movement with very little effort. 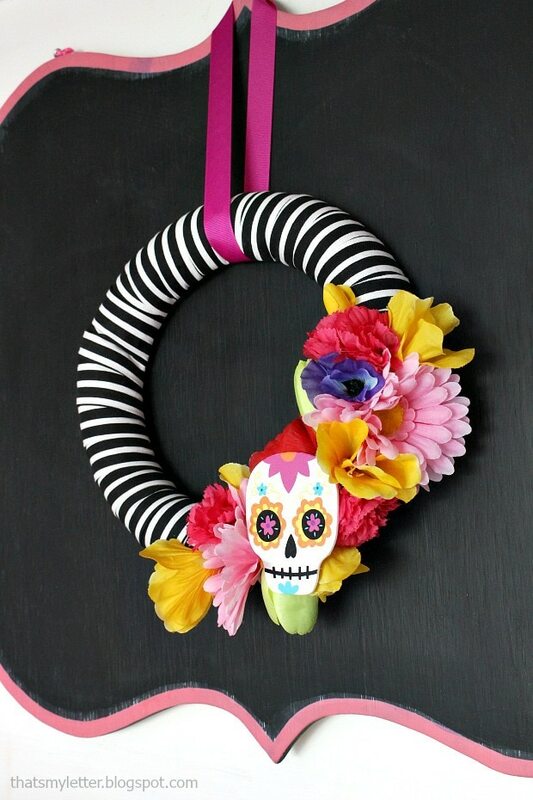 I made this quick foam wreath wrapped with fabric, added some dollar store faux flowers and hot glued on a wood cut out sugar skull. Easy. 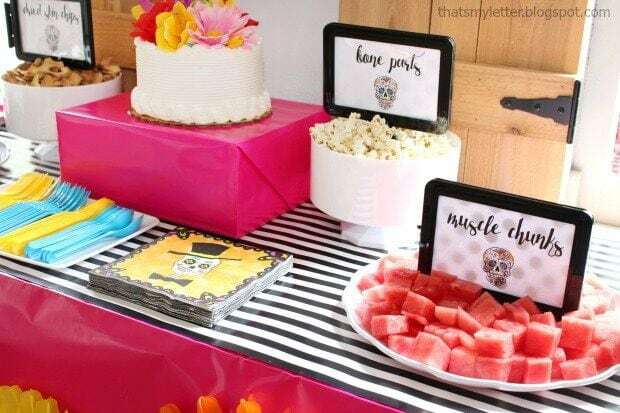 Simple but so fun and party appropriate. Rebecca at The Crafted Sparrow has a similar wreath which was my inspiration. 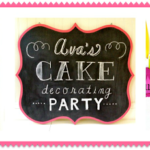 She has amazing crafts and decor! 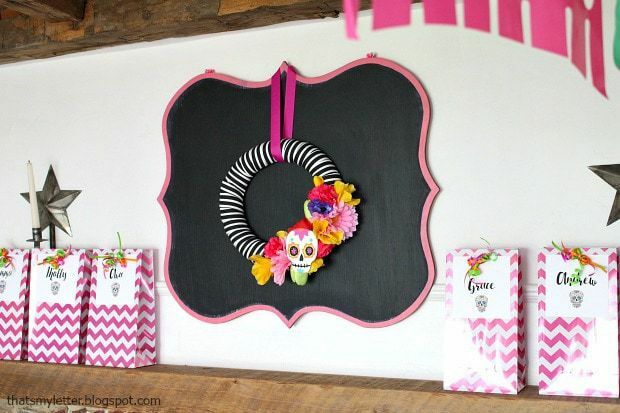 I had the chalkboard background from an old party awhile back which we use in the kid’s loft area so I pulled it down and hung the wreath in front. Perfect. 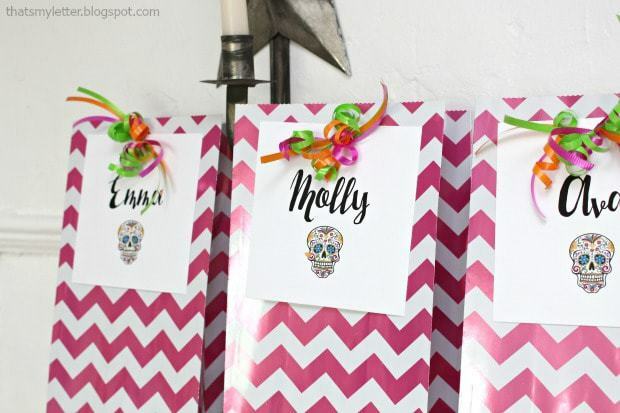 The favor bags are simple printed cardstock with a free clip art sugar skull and some curling ribbon. We used the bags to send home the crafts. 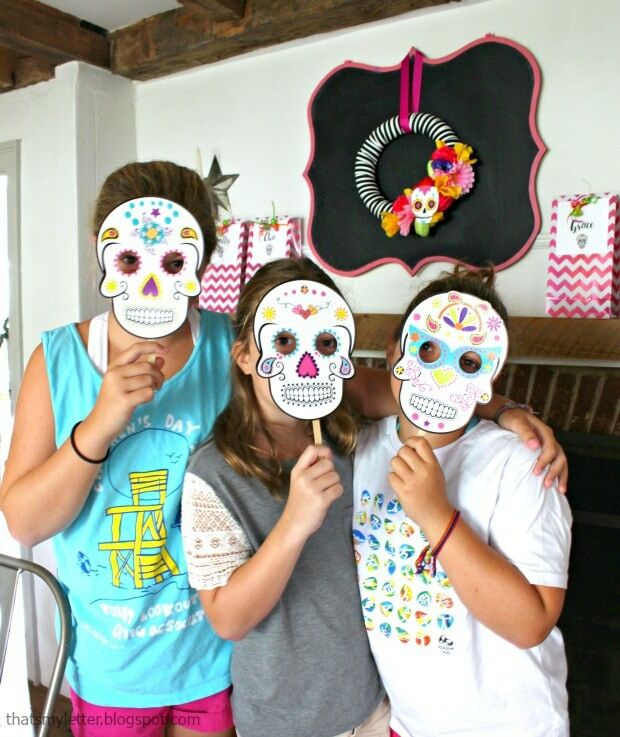 And speaking of crafts the kids made ceramic sugar skulls and I’m so sad I didn’t get an after shot of all their coloring magic. These mini ceramic skulls are about 4″ tall so really not that small. They are perfect for kids to manage and handle plus just the right amount of space to color before they get bored. I drew the designs with black marker before and they filled in using Sharpies in all the colors. And some hand held masks. We did do a little face painting but Mommy was too busy being the painter so no pictures. 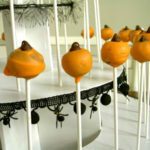 Such a fun, festive and non-scary Halloween party. Disclaimer: I partnered with Oriental Trading to bring you this post. I have received compensation and / or product for review however all creative ideas, thoughts and opinions are my own. 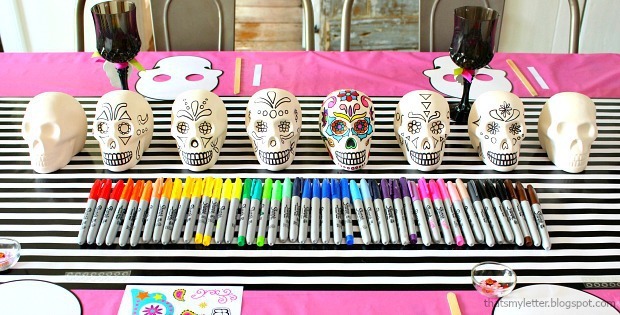 I'm going to have to check them out- I 'm crazy for sugar skulls!!!! It's not okay to pick and choose the pretty things out of a sacred, important cultural holiday that people of color celebrate and turn it into a whole new context for the sake a "not scary Halloween" theme. 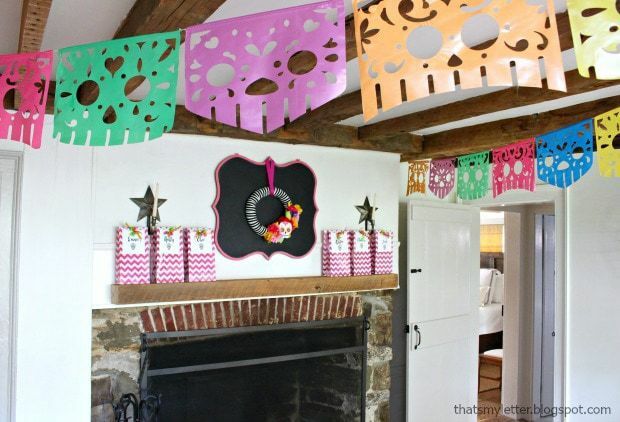 Picking out your favorite parts of a deeply rooted religious tradition is trivializing and commercializing Mexican culture.